Home › Personal Injury › Auto Accidents › How do you know which personal injury attorney to hire? How should you hire for your personal injury claim? It is very important that you hire the right personal injury attorney. Who you hire will determine how pleasant or how unbearable the personal injury claims process will be for you. If you trust us with your case, then know that we will deliver. What are some of the differences between attorneys? Unfortunately many people have had a bad experience with an attorney in the past. These bad experiences typically involve poor communication, bad attitudes, and disappointing results. Legal Skill: Some attorneys do not specialize in personal injury. These attorneys often handle whatever claim walks in their door. The Griffin Law Firm has focused exclusively on injury and disability law since 1995. Work Ethic: Some personal injury attorneys may be too busy or just not willing to work hard. The Griffin Law Firm is committed to working hard on your case and putting forth the effort needed to win your case. Professional and Friendly Attitude: Some attorneys are arrogant, aloof, and just plan unfriendly. The Griffin Law Firm will treat you in a friendly and compassionate manner. How do you know that the Griffin Law Firm will provide outstanding customer service while delivering great results? 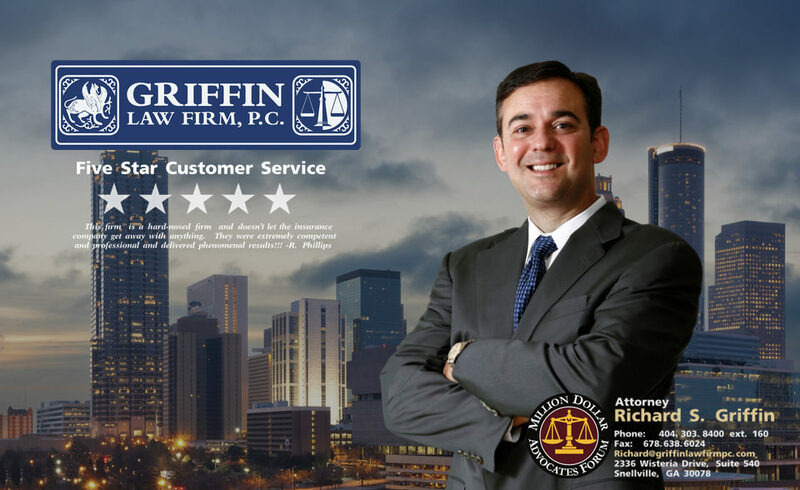 For this attorney Richard Griffin recommends you review our client reviews, firm awards, and settlements and verdicts with the below button.